Today we have enjoyed a beautiful sunny day here in Sweden. The background is made from Watercolor cardstock. I used Grit paste and stencil THMS 056, in the upper left corner and lower right corner. Let the paste dry. Then spray the background with Distress Oxide spray´s in Peeled paint and Faded jeans. When dried, I used the same stencil and sprayed water on it, then pressed to the background to get some "ghost" effect. Distress ink in Walnut stain around the edges. I stamped The professor from set CMS373 on watercolor paper with Jet black Archival ink, then colored him with Distress reinkers and Distress ink´s. I diecut the globe, Destination Thinlits die 664179, from Metallic gold Kraft cardstock and sanded. Then I diecut the Steampunk parts from chipboard and Metallic Gold Kraft cardstock, from Tim´s Sizzix Bigz die 664185, Steampunk parts. Here you can see the "zigzag" stamp on the background as well. I diecut the "Explore" word (Thinlits 661803 Traveler words) from Black Kraft cardstock and sanded. I mounted on a panel cut from Metallic Gold Kraft cardstock, which also is sanded and Distressed with Walnut stain Distress ink. I used some steel wire from stash around the first panel. I mounted the whole cardpanel on Black sanded Kraft cardstock and then on a sanded Metallic Gold Kraft cardstock with Walnut stain Distressed edges. Then finally on a black cardblank. I used 3D adhesive between all layers for dimension. 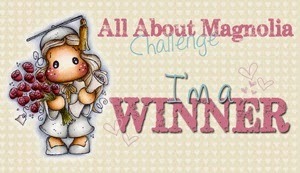 I will try this card in the TIMI Challenge on the Craftstamper blog. 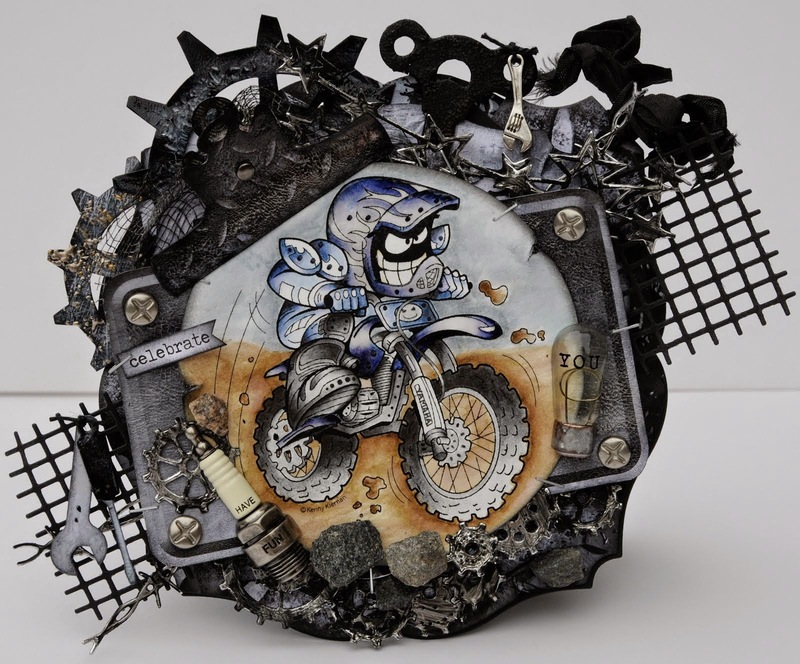 Today I want to share a card I made with Tim Holtz products and with a metallic look. I started with my backgrounds, using Metallic craft cardstock, and on the main background I used the Foundry embossingfolder, and then diecut with my new Sizzix TH die Splash. And for the background behind the diecut hole I used an older TH embossingfolder. I sanded both backgrounds and on the one which was embossed with the older embossingfolder I used some black Distress crayon, to achieve the look I was after. On the "Foundry" background I sanded, and added some black acrylic paint, then let that dry a while and then wiped it off. I let the color remain in some areas then added som color from Rusty Hinge and Peacock feathers Distress crayons. For the embellishments I used the new Voltage die, which I like a lot! It is so cool! 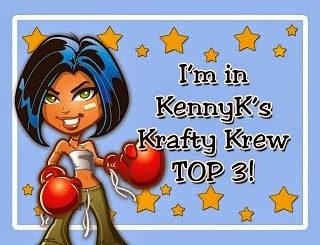 I cut it out from chipboard then from Kraft cardstock/Metallic craft cardstock. I glued all the papercuts to the chipboard. That gives a sturdy feel and 3D effect. I sanded all the pieces and used Black soot Distress ink on all the edges and on the metallic pieces I used some Rusty hinge Distress crayon to get some rusty details on the bolts and the metallic plate. When I made this card I hadn´t received my Professor stamp set so I had to come up with another idea to get the scale on the Voltage die, so I used a piece from a stamp in set CMS128 Road trip. I embossed the "scale" with silver embossing powder. Then I made the Route 66 sign, where I used another stamp from CMS128 Road trip. Number 66 is Ideaology Numeric which I have painted with red and black acrylic paint. I fastened the sign with two Ideaology Mini fasteners. I stamped the Roadtrip stamp from the same stampset as earlier with black archival ink on some sanded Kraft cardstock. Then I used a white Posca pen to write around the stamped text. I matted the word on some red sanded Kraft cardstock and put it on the card fastened with a Ideaology hinge clip. I finished the card off with a storystick and a long fastener. I used Distress crayon in Festive berries on the story stick to highlight the word travel. Then I mounted my cardpanel on some red sanded Kraft cardstock panel and then on a black cardblank on 3D adhesive to get some height and layers. Hope you like this project, and thank you very much for visiting. 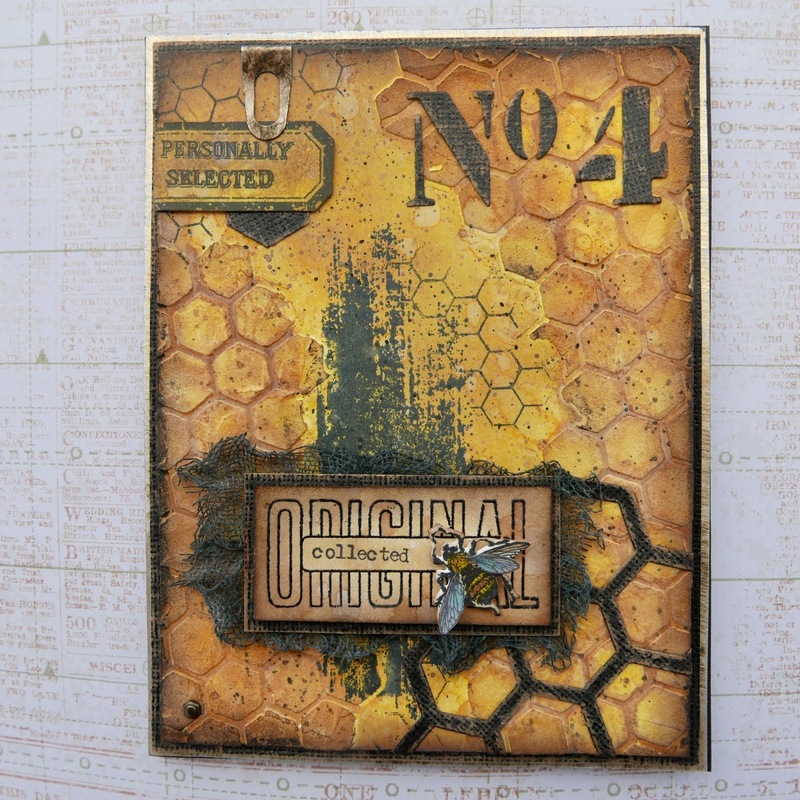 Today I will show a card using some of my “bee themed” products from Tim Holtz. I started with the background, Distress mixed media heavystock and used some Texture paste opaque through a Tim Holtz honeycomb stencil THS005. Let dry. Then I used Mustard seed Distress Oxide. Then I put some Gathered twigs DOX on my craftmat and mixed with water. I used a brush to put on the “wash” and let it “pooled” around the texture. I like that effect. Finally I distressed the edges with Walnut stain Distress ink, and then splattered acrylic paint in black over the background, and also splattered some Gathered twigs DOX. 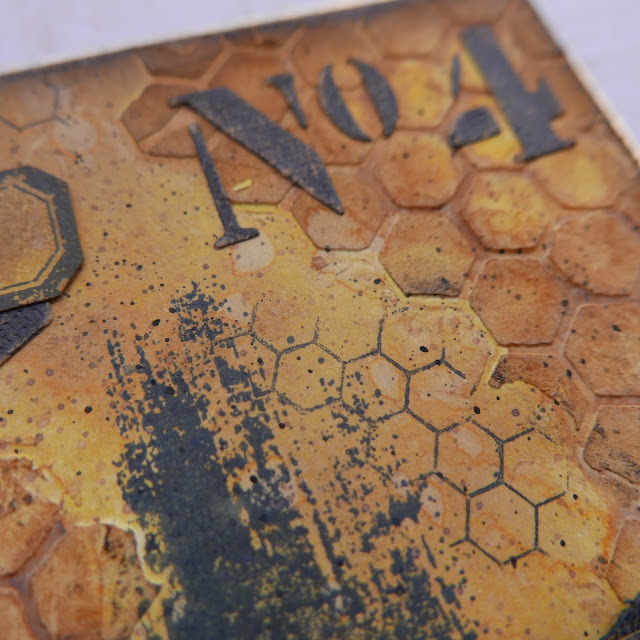 I then stamped the background with a Tim Holtz honeycomb clearstamp and then with a brushstroke stamp from CMS293. I like that stamp a lot. The “No 4” is from TH die set 661187 Stencil numbers. I cut it from Kraft cardstock in black and then sanded for a distressed look. Here you can see the stamps, the “pooling” and the splats. The bee is a stamp from CMS328 Entomology. I stamped the bee and colored it with Distress ink´s and cut it out with the coordinating dies from Sizzix. Very convinient! Then I stamped the it again on wellum, cut out the wings, colored them with Distress ink´s and glud them above the other wings to get som layering. The word "Original" is a stamp from CMS339, Mailart, which I stamped and embossed with Black embossingpowder. The word "collected" is from CMS 120, Small labels. I inked the background on the "Original plate" with Gathered twigs Distress Oxide and mounted it on some black, sanded kraft cardstock and some Mummy cloth which was colored with Black soot Distress Oxide. 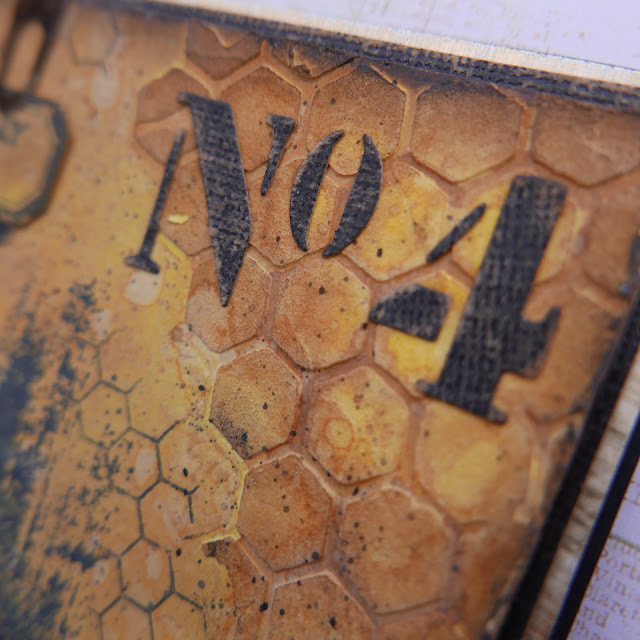 The honeycomb is die cut from Tim Holtz edge die Honeycomb. "Personally selected is a stamp from CMS358, Music & Advert. I fastened the label with a Ideaology clip which I have colored with Mushroom Alcohol ink. Hope you enjoyed my card! 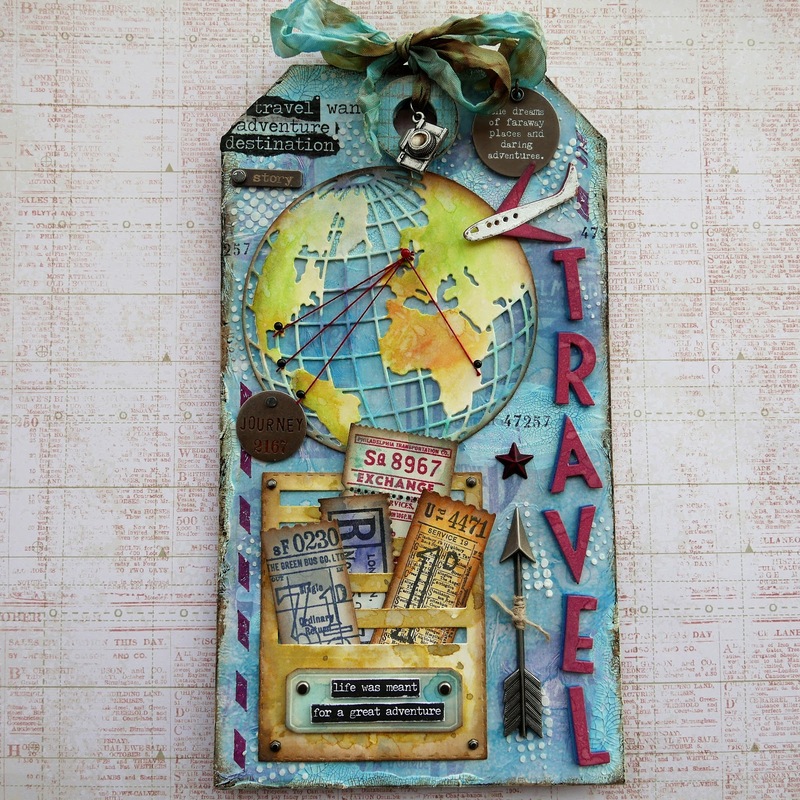 I have made an Tim Holtz Etcetera tag with travel theme. Me and my husband love to travel and we travel as often as possible. So I thought it would be nice to made a tag with that theme. I started with the background on the tag, using Tissuepaper and stamped some Travel labels from CMS108 with Archival ink in Cobalt blue, then I glued it to the tag with Distress collage medium, tried to get some wrinkles for texture. I put a layer of watered down gesso on it to knock the stamped images back a bit. I used some crackle paste on random places to get some more texture. On this photo some small wrinkles from the tissuepaper is shown, under and beside the star. Then I used some Distress ink´s in Tumled glass and Broken china to colour the hole background. At last i used a dotted Tim Holtz stencil and some texture paste opaque matte for even more texture. Then I diecut all the embellishment pieces, all from Sizzix Tim Holtz dies, the globe 660214, the aeroplane from 661809 Cityscape commute, the tickets from 662698 Ticket booth and the sloth from 662697 Stitched slots, from Distress mixed media heavystock. I used Distress ink´s and Distress oxide´s to colour the pieces. The stamps used for the tickets are CMS337, Ticket booth. The word Travel are cut from a Sizzix Tim Holtz die called Deco alphabet. I cut it from chip board and twice in Mixed media heavystock and coloured all the letters in blue Distress oxide ink and then in Aged mahogany Distress oxide. Then i mounted them on each other to get some height on the letters. Then I started to mount all the details to the tag, I used Distress collage medium to glue them all in place. On the globe I used some thread and needles to mark out some of my favorite travel destinations. I distressed all diecuts accept from the letters with Walnut stain Distress ink. I used some designtape pieces in the upper left corner, and a story stick. I used Distress crayon on the stick to better show the word on the stick. Some more Ideaology pieces as decor. I used some of the Correspondence stamps CMS 255 in Jet black and Plum Arcival ink as well. The aeroplanes body in silver, is sanded metallic cardstock. The star is an Ideaology adornment star which I have painted with red acrylic paint and Mushroom Alcohol ink on the top. I sanded the edges on the small talk sticker and mounted it with 3D adhesive. I used 3D on many of the diecuts for dimensions. I used Distress crayon in Walnut stain on the edges around the whole tag. Love how that looks on the crackle paste areas. I tied a piece of hemp string on the Ideaology arrow. I used Distress stain in Tumled glass and Walnut stain to colour the bow on the top of the tag. I used some Alcohol ink in mushroom on the lens of the Ideaology camera. What a cool Ideaology piece, the camera! I have used a Tim Holtz stamp on the reinforcer of the tag. I hope you have enjoyed this post! I really enjoyed making this tag. 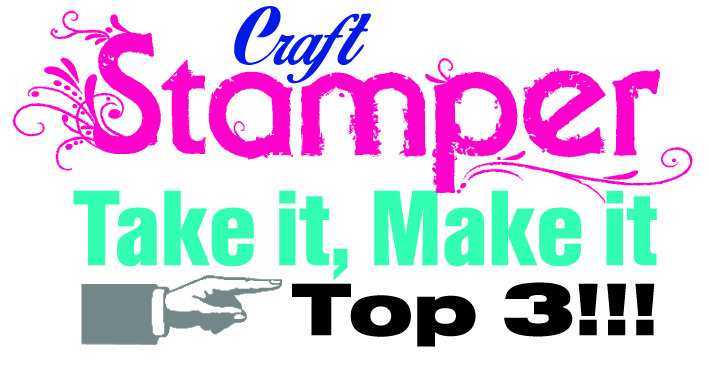 Today I will share a card I made with Tim Holtz Hipster stampset, CMS288. I started with the background and used Distress Oxide in Gathered twigs. Then I used my mini shifter stecil diamonds with Distress ink in Rusty hinge and Gathered twigs. I spritzed the background with water after using the shifter stancil so the pattern will be a little blurry. Then I took Black soot Distress ink through my Eyechart stencil THS010, and after that I stamped through the stencil with an alphabet stamp from CMS090 Going somewhere and Jet black Archival ink. Then I stitched the edges with my sewing machine and inked the edges with Distress ink in Walnut stain. I made a frame from watercolor cardstock and Rectangle stitched dies, used Distress inks in Gathered twigs, Walnut stain and Broken china to color the frame. I colored the ostrich with Distress inks. And I also colored a flower from Ideaology bouquet with Distress inks and put it in her hat. I used Glossy accents on her glasses to get the look of glass. I diecut three glasses from Sizzix Tim Holtz dies 660953 Crazy things from Craft- and Coredinations cardstock. I cut out circles from OH-film as glass and glued them in to the glasses. (It,s all in the details ;) ). "See you" are cut from my Traveler words die from Sizzix TH, 661803, from Coredinations cardstock. I sanded the glasses and the letters. I used a "No 247" story stick and a long fastener on the frame. I used Distress crayon in Mermaid lagoon and Picket fence in the "No 247" so it should be more visible. I colored a wordband in the same way as the storystick and mounted on the frame with some hempstring. Above that in the left corner i put a piece of Ideaology filmstrip and a sanded milkcap. The milkcap has inked edges with Walnut stain Distress ink. I mounted my card on a black base and a panel of sanded Coredinations cardstock. I used 3D adhesive between the layers. I also used 3D adhesive behind the ostrich head. Today I will show a Valentine card I have made for my beloved husband. I started with the background using Distress Oxide in Gathered twigs on Distress mixed media heavystock, and then stamped it with the text stamp from CMS328 Entomology set with Archival ink in Sepia. Then I diecut the hearts with a movers & shapers die and then used the same "treatment" as the background on the hearts. Then adhered the hearts to the background with Distress Collage medium. After that I colored the hearts with Distress crayons in Festive berries and Gathered twigs. I used Grit paste and Distress crayons round the edges to get some texture and a distressed look. I diecut the "love-sign" from Woodgrain cardstock with Sizzix Tim Holtz Planks die. I inked it with Distress Oxide Gathered twigs and Distress ink in Walnut stain. For the word I used my Sizzix Tim Holtz Deco die. I cut the letters first from chipboard and then from Kraft cardstock which I sanded, then glued them together, for dimension. I used ideaology mini fasteners and hempstring for the hanging. I used a Ideaology Hitch fastener to hang the sign on. The sign in the upper left corner is a Ideaology Wood slice which I distressed the edges on with Distress ink in Walnut stain and mounted a story stick on. I used Distress crayon in Festive berries on the story stick to get the word more visible. In the lower left corner I used some Ideaology pieces, such as Mummy cloth colored with Distress stain in Festive berries and Frayed burlap, a piece of Ruler ribbon inked with Walnut stain, Ruler piece distressed with Walnut stain ink and finally another Hitch fastener. I hope my husband will appreciate this card. Today I will show a card I made for a man who turn´s 80 in February next year, ha ha, I thought it was this year but it is great to be ahead schedule. I started with the small tag on the card. I used Tim´s tag dig for the tag and cut it out from Distress Heavystock. Then I stamped parts of CMS360 Inventor 6 on the tag. I then used Gathered twigs Distress Oxides on it. Then I covered it with Distress Collage medium and on some parts Distress Collage medium crazing for the texture. Then I used Distress Crayon in Walnut stain on the crazing and round the edges of the tag. Then I made the background of the card. A piece of Distress Heavystock, used the Gears 3D texture fade and put some crackle paste on the folder, then through my Big shot. After that I inked the hole surface with Distress ink Walnut stain. Covered it with Distress collage medium. Then I used Distess Crayons in Walnut stain, Black soot, Rusty hinge and Iced spruce. Then I used my sewing machine round the edges. I diecut gears from chipboard and used Distress Oxide in Rusty hinge to cover them, then I sprayed them with Distress resist spray. 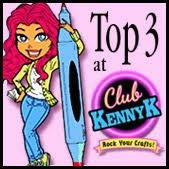 Then I used Distress crayons in different brown and black colors. I like the texture you can get with the Distress spray. I also diecut a globe from Tim´s Sizzix Globe die, from Kraft cardstock and sanded it for a more distressed look. I used Tim´s Ideaology Hexagon fasteners in the middle of the gears. Here you can see the texture that the Distress collage medium crazing did. Here you can see all the layers of the card. I mounted the background on sanded Kraft cardstock and then mounted that layer on a Kraft core metallic piece that was diecut with Tim´s die Stitched rectangels and then also sanded. The "arrows" are from a Sizzix Tim Holtz die called Shape strips. And the number´s 80 are from a Sizzix Tim alphabet die called "Deco" which I love. I cut 80 both from metallic Kraftstock and from blue Kraft stock and sanded both and glued them a little bit offset. To finish off my card I colored a paper doll with Distress markers on some of his clothes and also put a Small talk sticker on the card. You are also welcome to my Instagram account, sncrafts.